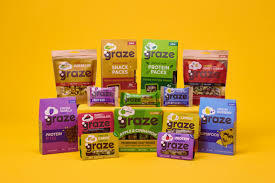 Unilever today announced it has acquired the holding company of graze, the UK’s leading healthy snacking brand. Anthony Fletcher, graze CEO said: “This deal marks a transformational moment in graze’s growth journey. graze believes that learning from Unilever’s sustainable living plan will become a key driver for the business. This announcement may contain forward-looking statements, including ’forward-looking statements’ within the meaning of the United States Private Securities Litigation Reform Act of 1995. Words such as ’will’, ’aim’, ’expects’, ’anticipates’, ’intends’, ’looks’, ’believes’, ’vision’, or the negative of these terms and other similar expressions of future performance or results, and their negatives, are intended to identify such forward-looking statements. These forward-looking statements are based upon current expectations and assumptions regarding anticipated developments and other factors affecting the Unilever Group (the ’Group’). They are not historical facts, nor are they guarantees of future performance. Because these forward-looking statements involve risks and uncertainties, there are important factors that could cause actual results to differ materially from those expressed or implied by these forward-looking statements. Among other risks and uncertainties, the material or principal factors which could cause actual results to differ materially are: Unilever’s global brands not meeting consumer preferences; Unilever’s ability to innovate and remain competitive; Unilever’s investment choices in its portfolio management; inability to find sustainable solutions to support long-term growth; the effect of climate change on Unilever’s business; customer relationships; the recruitment and retention of talented employees; disruptions in our supply chain; the cost of raw materials and commodities; the production of safe and high quality products; secure and reliable IT infrastructure; successful execution of acquisitions, divestitures and business transformation projects; economic and political risks and natural disasters; financial risks; failure to meet high and ethical standards; and managing regulatory, tax and legal matters. These forward-looking statements speak only as of the date of this announcement. Except as required by any applicable law or regulation, the Group expressly disclaims any obligation or undertaking to release publicly any updates or revisions to any forward-looking statements contained herein to reflect any change in the Group’s expectations with regard thereto or any change in events, conditions or circumstances on which any such statement is based. Further details of potential risks and uncertainties affecting the Group are described in the Group’s filings with the London Stock Exchange, Euronext Amsterdam and the US Securities and Exchange Commission, including in the Annual Report on Form 20-F 2017 and the Unilever Annual Report and Accounts 2017.